Ameritex Movers loves being involved and active in the local community. If you’re curious about what we’ve been up to lately, you’ve come to the right place. Check out our latest press releases below. Ameritex Movers co-owner Beth Rohani presented Youngblood Intermediate School students with a $1,000 donation April 10 to help them build birdhouses for the Alief Community Garden. The donation was part of Ameritex’s ongoing support of Alief ISD and the Environmental Urban Design Committee of the International Management District (IMD). “You can look at a local business like a neighbor. Being a good neighbor is important to us, and supporting your community goes hand in hand with that,” Rohani said. Ameritex Movers brings the holiday spirit this year with an untraditional Christmas tree and the mindset of giving back to the community. The Houston-based moving company created a one-of-a-kind Cardboard Christmas Tree with supplies they use to move customers every day. 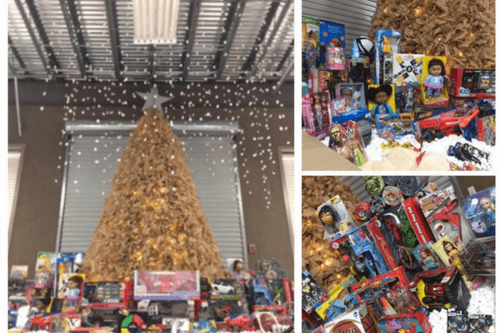 They also decided to take an out of the box approach with transforming their traditional holiday gift swap into a toy drive for the students at Alief Independent School District’s Mahanay Elementary. The Cardboard Christmas Tree was made out of 1,000 sq. ft. of packing paper and stands 12 feet tall and 8 feet wide. The tree is the latest addition to Ameritex’s collection of cardboard creations. Past designs have included fashionable cardboard couture clothing wear and a cardboard replica of the city of Houston including the GRB, Discovery Green, and the Houston Astros Logo. The tree can be found at the Ameritex Movers headquarters in SW Houston, and all are welcome to come see it. The Houston Business Journal named Ameritex Movers the 30th fastest-growing company in Houston at the Fast 100 awards ceremony. Click here for details. 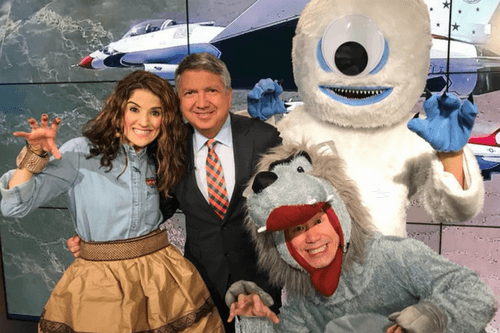 Ameritex Movers co-owner Beth Rohani appeared on KHOU 11 News and Fox 26 with Henry Yau of the Children’s Museum of Houston to promote a fun costume design workshop and trick or treating event at the museum. Watch the video here. In collaboration with the International District, Ameritex Movers seeks to bring the community together and promote neighborhood safety at 6 p.m. Oct. 3 at its location on 9200 W Sam Houston Parkway S.
The event will be a fun activity for families in the community to meet and get to know one another, learn about neighborhood safety, and have fun. There will be dragon dancers, music, games, food, and drinks to entertain neighbors of all ages. There will also be local law enforcement officers to advocate for crime prevention and to build partnerships with local neighbors. For the second year in a row, Ameritex Movers has landed a spot on the Houston Business Journal’s Fast 100 list, a comprehensive collection of the city’s fastest growing private companies. The Fast 100 contains local businesses from all industries who have been in business at least five years, has corporate headquarters in the Houston metropolitan area, and earned at least $1 million in revenue in the most recent completed fiscal year. Note: event rescheduled to Sept. 24. 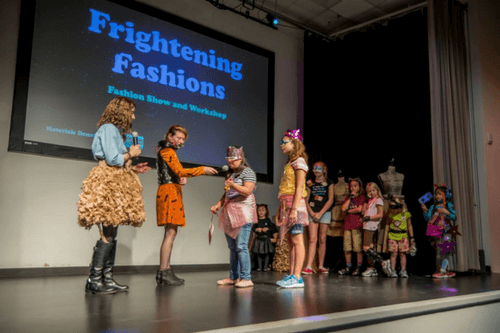 Houston children are invited to roll down the runway in Troll-inspired fashion Sept. 24 at the Children’s Museum of Houston. Kids can attend a how-to workshop to create their own designs starting at noon, which they can model in a fashion show at 2 p.m. This event has been rescheduled from its originally planned date of Aug. 26 due to Hurricane Harvey. The Trolls Fashion Workshop and Runway Show — sponsored by local moving company Ameritex Movers — will start with a workshop from noon to 1:30 p.m. at the Brown Auditorium, followed by the fashion show at 2 p.m. at the Kids’ Hall Alcove. Sign-up is not required for the workshop — children and their parents are welcome to stop by the auditorium and get to work. However, there will be a sign-up for the fashion show. Participants must register by 1:30 p.m.
Click here to read the release and more information on the Children’s Museum website. Students win premium prizes for designing robots out of cardboard boxes. Alief Independent School District partnered with Ameritex early this month to inspire creativity and encourage recycling through a BoxBot contest. Thirty Alief ISD middle schoolers competed to create the best robot design out of two cardboard boxes and other recycled materials. On July 13, the groups hosted an awards ceremony to announce the contest finalists after students worked hard for 10 days to build their custom robots. Five finalists were selected, listed below. Click here to read the release and watch the video. Joint project inspires students to creatively repurpose everyday objects. Middle school students in the Alief ISD after school program are finishing the summer session with some outside-the-box thinking. Beginning July 10, they will be participating in a contest to see who can design the most creative robot concept out of two cardboard boxes. Judging begins July 11, with a panel of judges from throughout the Houston community in a variety of leadership positions. There will be an awards ceremony at 2 p.m. July 13 at Alief Middle School to announce the winners. One of the district’s deputy superintendents will be in attendance to present the award. Read the rest of the release here. Cardboard model of Houston skyline to remain on display through Labor Day. 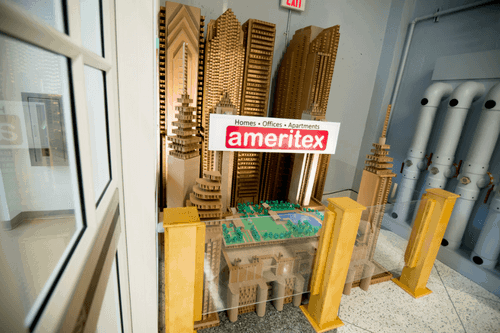 The Children’s Museum of Houston and local moving company Ameritex Movers announced today the museum’s newest installation — a lifesize model of the Houston skyline made out of cardboard. Visitors can enjoy the display now through Sept. 4. It is located just outside the Invention Convention Gallery, which focuses on maker and engineering concepts. The cardboard model was created by team members of Ameritex Movers, and reaches 8 feet tall and 10 feet wide. The piece took over 125 hours and 700 sticks of hot glue, and was made out of packing supplies the moving company uses on a regular basis. The cityscape includes well-known staples of Downtown Houston, including the George R. Brown Convention Center and Discovery Green. Ameritex Movers took home a first-place prize for the single booth display on May 18 at the Houston Apartment Association Education Conference and Expo. The annual event is the largest local apartment association expo in the country. 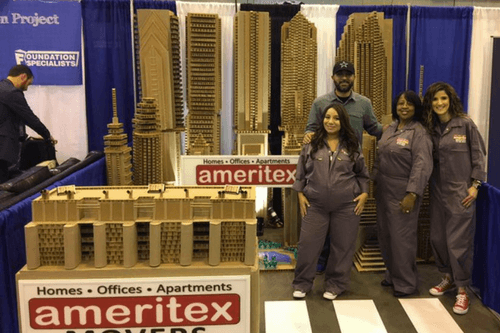 Ameritex Movers’ winning booth featured a cityscape of Houston made out of cardboard. The structure includes a display of skyscrapers, the George R. Brown Convention Center and Discovery Green. For any media inquiries, please send your requests to social@stressfreemove.com.